Jeffery Ngyayot (left) against Sequan Felton, by Errol Daniels. 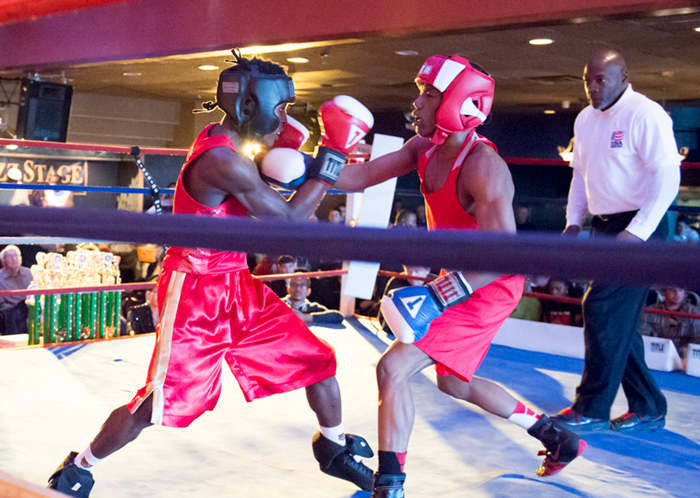 Last Saturday’s Golden Gloves championships featured a slate of Upstate fighters coming into Amherst’s The Forvm and wresting the golden ticket to the national competition from the hometown fighter. The exceptions were Buffalo’s Joe Taylor and Elchin Aliyev, who each won their 3-round bouts by decisions both practical and curious. In Taylor’s case, the trained kickboxer and MMAer stalked his opponent from Syracuse, Chris Adams, looking at all times ready to throw kicks or enter submission holds. In boxing, of course, both such tactics are verboten and while the fight was clinch-heavy and sloppy, it put the rugged Adams completely off his rhythm and once he tasted a slice of Taylor’s 201-pound power he began a three-round-long backpedal that made it easier for the judges to score. In Aliyev’s case, it was hard to make sense of the 3-2 decision for the hometown fighter hailing from the Northwest Buffalo Community Center gym. It was a close enough fight, but Albany’s Scott Baker had the upper hand in all three rounds, landing cleaner shots and controlling the pace. In the second round, each fighter landed heavy on the other and the ref curiously stopped the action and gave the Albany fighter a standing eight count. Though Baker’s back was turned to this reporter and there was no chance to really see if the middleweight had been hurt enough to warrant the standing eight, which in amateurs counts as a knockdown point, it was still pretty evident that Baker was unaffected by the scoring blow. That one point made all the difference in the 3-2 decision in Ayilev’s favor, a decision that was initially read by the ring announcer as being for Baker. A stunned Aliyev and officials ringside immediately protested the announcement to have it changed. A strange moment in the night that betrayed a strange smell to many observers ringside. The crowd inside the narrow confines hovered around 500 and a had an old-time feel minus the tobacco smoke but plus the father sitting in the $35 VIPs showing his son YouTube compilations of one-punch knockouts on his phone. Which is to say that no one paid much mind to the strange outcome of the Baker-Aliyev fight. Griffin Tolsma lands a left hook on Liam Grogan, by Errol Daniels. Baker’s Albany City Boxing stablemate left nothing to chance against Buffalo heavyweight Erik Rogers in the night’s finale. The intensely calculating Brandon Lynch dismantled the seasoned Rogers with speed and power sending him to the canvas three times and in the second round, and forcing the ref to stop the fight, even after Rogers passed the ring doctor’s sniff test between knockdowns two and three. Besides Lynch, the other boxers who stood out in terms of pure boxing ability and athleticism were Albany’s junior welterweight Abraham Nova and Rochester’s middleweight Wilmont Wood. Nova picked apart Buffalo’s Daniel DeJesus with a lead left hook that the Westside Boxing fighter had no answer for, winning a unanimous decision. Wilmont Wood continued his impressive tournament by besting UB Boxing’s awkward and tricky southpaw Timi Akeredolu 4-1. Griffin Tolsma (left) and Liam Grogan, by Errol Daniels. Oswego’s Thomas Nitzke used his height and length as a clear advantage over UB Boxing’s Andrew Thebner. Nitzke was able to just load up his right on the incoming Thebner’s face all three rounds of the fight in near-comic fashion. Syracuse’s Jarred Nosewicz was more accurate against his welterweight opponent Mike Christopher, also from UB Boxing. But Nosewicz’s precision didn’t keep Christopher from luring the Central New Yorker into a street fight in the middle of the ring in the third and final round that brought the crowd to a fever pitch. The air in the balloon was let out, though, when Nosewicz’s arm was raised prompting trainer Frankie Alagna to jump in the air. FLARE Center’s Douglas Chavers impressed with a dominant sub-novice take down of Kendric Duncan, scoring three knockdowns in the 2nd round. Duncan was hurt badly enough by the first knockdown that ringside there were cries for the fight to be stopped right there. Especially for a fight between two green light heavyweights. True to form, Duncan never recovered from the first beating. In other action, Rochester’s Sequan Felton punched his ticket to Vegas winning his second consecutive championship fight over his local historic rival, Westside’s Jeffery Ngyayot, in a close majority decision. Felton lost his first fight in last year’s nationals, and said he was determined to get further this time around. Ngyayot came on strong in the third but it was too late. Romeo Gaines advances on Alex Castellano, by Errol Daniels. Alex Castellano bested a game Romeo Gaines in a featherweight match bout, beating Gaines to the punch in the first two rounds before Gaines pushed the pedal in the third. Buffalo PAL’s Davail Steele easily dispatched with Terri’s Fitness Rich Lambert, and Anthony Baxter won a split decision over Frank Price. Hometown fighters Akeredolu, Rogers, Ngyayot, Christopher, DeJesus all missed their flights to Vegas at the hands of traveling boxers. Chatting ringside along part of bar with heavyweight prospect Drew Graziadei who was sipping water, he explained that it’s often easier, psychologically, to travel and not fight in front of everyone you’ve ever known. Rochester’s Lawrence King, Syracuse’s Mike Parillo, and Buffalo’s Joe Reed all advanced to Las Vegas by walkover.